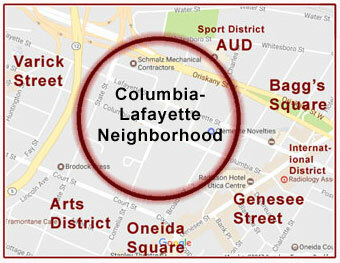 We represent the Columbia Lafayette Neighborhood (explore CoLa), in Downtown Utica. Roughly 50-acres in size spread across a 19 block sreet grid. BUD has setout to brand the neighborhood and our rich history. Today CoLa supports 40+ different businesses and hosts a wide variety of Historic Buildings. As others work to place Utica's New Hospital elsewhere, we are working to further develop our brand as we become an even more desirable place to do business, visit, and live! Our main plan is to connect with other Utica Neighborhoods, as well as redevelop our assets. As time goes by and our vision is acted upon, Downtown Utica's Columbia-Lafayette Neighborhood will offer great urban living options as we've started to list with our Vision for the Columbia-Lafayette Neighborhood.